Is that a dress from the H&M Garden Collection I see? 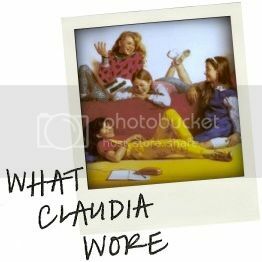 I'm really perturbed that Claudia stores edibles with her shoes. Moving you BSC books to make room for shoes? Hmmm....different priorities for different folks, I guess. 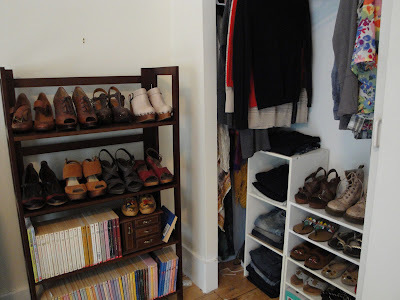 My closet is EXACTLY like yours. 'cept...ALL MY BSC BOOKS HAVE BEEN DONATED TO LOCAL THRIFT STORES. Oh gosh, this makes me mad that my mom insisted I donate my complete (at the time) BSC collection to the library when I was 15. I miss my Super Specials *especially*. 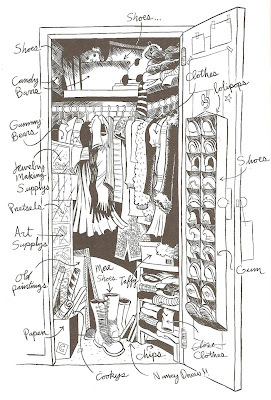 But your closet is splendiferous, and that rendering of Claudia's is ammaaaaazing. I love all her clueless orthography errors! At least she realized "close" couldn't possibly be right. Def. looks like my collection, except out of about 50 books I only have 3 super specials. I do have this BSC special letterbook, where they all go on holiday and you can pull out tiny letters to each other. do you really not like the covers of the reissues?? I think they are ADORABLE. They'll never touch the wonky paintings on the covers of the original but I think they are very fresh. Even...dibbly fresh. Although, I do have to say that I love the heels already on that shelf. Just stumbled upon your blog. Utterly hilarious and has totally inspired me to find my old BSC books. So jealous of the wardrobe even if it has meant the sacrifice of some books. Drop by, if you like, admittedly less funny but I'd love a visit.